Driving schools come in a wide range of styles, but there are core lessons in all of them that can save your life. When I started writing about cars it became clear to me that I had better up my driving skills a bit. Part of the job is testing cars on and off track, so I got my learn on and went to a driving school in New York at Lime Rock Park. The skills I learned and lessons I took away from the experience were a surprise to me. Since taking that driving class I have also taken an Introduction to Racing program and the lessons I learned in the Driving Skills class were immediately put to use. What I took away fro the driving skills class would be valuable for any driver and certainly for any new teen driver. Here is the overview of the main lessons I learned. Please keep in mind that this overview cannot teach you these skills. They must be practiced on a closed course. The lesson I was most skeptical about was “The car goes where you look.” The basic theory is that when the car is in a skid or not completely in control for some reason, and you are either struggling to regain control of it, or waiting to gain control of it, the car will generally go where you put your eyes. If you look at the oak tree you are sliding towards, the car will indeed find that tree. However, if you look where you want the car to go, generally the car will surprisingly, end up going there. 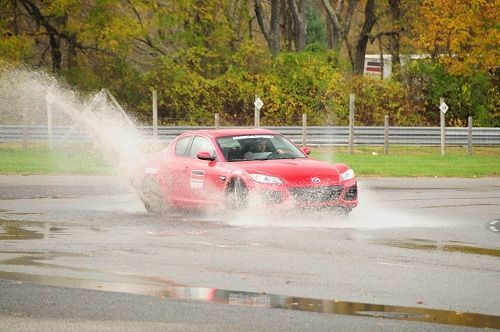 This skill was taught throughout the course, but it was most apparent on the skid-pad. A skid-pad is simply a circular track one drives on to allow the car to reach, and then exceed its limits. The car then starts to either plow (called understeer) or the tail comes around in a spin (oversteer), or after you have practiced a bit and been coached, you can make the car slide sideways in control. If you do that and you also look ahead to the path you want the car to go, it will do so. During the training when I spun the car or plowed to the outside of the circle the instructor would be yelling “Where are your eyes? !” He was always right. Each time I lost control I was looking where the car was going off the course, not where I wanted it to go. Since learning this I have applied it at racing school and also on the race track testing cars. I used it this winter on the road that leads to my home as well. More on that below. The full title of this section is “if what you are doing isn’t working stop doing it, and do something else.” This applies to all situations unless you are purposefully waiting to regain control as part of some kind of plan. Like if you are sliding sideways on purpose. Most of the time though, if things are going bad and you are hard on the brakes with the wheel locked to one side, keeping it that way is not going to help. I had this exact situation as my Highlander (with snow tires) slid towards a snow bank as I turned onto my street this past month. It all was happening slowly, so I looked away from the snow bank, and instead down the road I wanted to turn on, got off the brakes and softly on gas, reduced my steering angle and the car snapped right back into control and I turned down the road. I missed the snow bank by about a foot after what seemed like a sure hit was coming. If this skill could be taught to teens and practiced by our elder drivers it would help reduce the unintended acceleration accidents that happen when people accidentally apply full gas thinking they are applying the brake. By lifting off they would see that the car would then slow and they could have a second chance. It won’t always work, but I don’t ever remember anyone telling me this in Driver’s Ed or hearing it at any other time in my early driving years. I also don’t ever remember reading it when the media was hyping unintended acceleration last year during Toyota’s “day in the barrel” on that general theme. No, I'm not talking about age! One thing most people don’t understand is that the force your car is carrying down the road is dictated by the formula half the Mass x Velocity squared. The squared part is important. It means that if you go 30% faster, say like 45 instead of about 35, you are not carrying 30% more energy. It is waaaay more than that. So your stopping distance is not linear. In other words the amount of time you have to stop the car is shorter, not the same, and the distance it takes to stop the car is dramatically longer than one would think. This was demonstrated by a simple scenario we drove at driving school. We would accelerate down a stretch and level off at 35. There was a braking cone marking a spot at which we would brake hard. Cones were set up ahead of us we were to stop in front of. After practicing we could do it. Then the instructor asked how much farther the cones would have to move down the course if we instead went up to 45 and then tried the same stop. Nobody got it right. The cones had to move much, much farther down the course. A good thing to keep in mind on side streets when the speed limit is 30 and you are exceeding it. Because very few of us can drive worth a damn, and because there are advantages to those who can as well, anti-lock brakes are now on all cars and trucks (and airplanes, by the way, which is where the technology started). Rather than try to explain vehicle dynamics and how the weight transfer to a single front wheel may not be the best way to start an evasive maneuver, we are instead taught to “Stomp and steer.” I won’t say we should change the mantra. In a world where children drive cars while texting, that will be our best bet. However, for those who wish to learn, there are a lot better ways to approach some coming obstacles than forcing your car to put all its weight on the front tires then turning hard so that all 4000 pounds of your car, plus its momentum, is shifted to the single outside wheel of the turn you are going to make under full brake force. Hope I didn’t lose you there, but when you practice driving around some cones it quickly becomes apparent that steering first, then full braking while pointed straight is often a much better way around a stopped car or a pedestrian ahead. As a male, and since I was special, I had the gene for being the best driver in the world. As a graduate of driving school I learned I was not the best driver, and in fact I was not even average. At driving school it quickly becomes obvious that none of us is good at things we have not yet learned, and few of us are really that great even after we have been shown the right way. Doing something well takes practice. Being young, or being experienced, being male, or being you does not have any impact on this. The oldest, or the youngest pro driver that takes you around a course on a hot lap is within tenths of a second of all the other drivers. That is because they all do the same things. The right things. During our driver’s training we all came to respect just how well the youngest drivers adapt (some had never driven a car – ever) and just how quickly the most un-athletic drivers also adapted and improved their skills. The day closed with a sort of relay race which combined all the lessons we learned. Each driver’s time on the course was recorded by the instructors. Of about 25 students I am proud to say I came in third. The late-middle aged mom who won - and beat us all handily - was well below average at the beginning of the class. Maybe she listened and applied her training the best. I think she cheated. How could she beat me? I’m special! Photograph of John Goreham in a perfect drift by John Goreham. Please steal it. The locals wht o don't want Sunday racing at LRP will be delighted to discover it has moved west over into New York state. See Lakeville Journal volume 120 number 3 (August 25, 2016) page A5 for the very latest from Skip Barber.